The AQUACREST Whole Home System Replacement Filter reduces more than five contaminants in your water, including chlorine, bacteria and sand. Includes one replacement filter compatible with the GXWH40L and GXWH35F systems and made for simple and easy filter installation. Recommended replacement every 6 months or 30,000 gallons for fresh, filtered water throughout your entire home.  Enjoy fresh water by replacing your filter every 6 months or 30,000 gallons, whichever comes first will vary based on water quality.  Interchangeable with American Plumber W50PEHD, GE FXHSC, Culligan R50-BBSA, DuPont WFHDC3001, Pentek R30-BB and other brand whole house filters that use 10" x 5" inches filters and 9.75" x 5" inches filters; Compatible with GXWH40L, GXWH30C, GXWH35F, GXWH38F, GNQH38S and most systems with 10" x 4.5" filters. 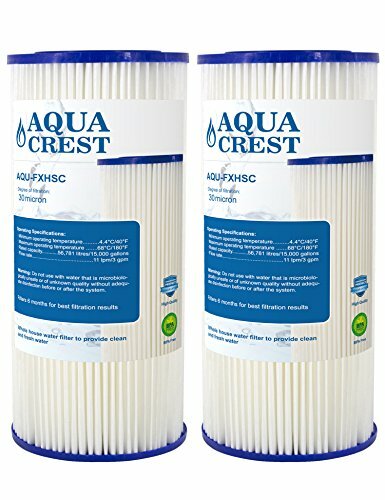 AquaCrest is an independent brand. This filter is not an original product.